Bookings cancelled 7 days before the class will not be refunded but can be exchanged. Now you can book a one-on-one private class with Carol Burgers, on a date of your choice! This truly is an amazing opportunity to hone your skills and learn from the best in the business! The class is fully customisable and will be adjusted to your skill level and speed. Classes usually run for 6 hours. The amount you will learn in this class in incredible because of Carol's exceptional guidance and techniques. This is an absolute must for all beginners or people just wanting to take their cake decorating skills to the next level. To book or enquire about dates, please send an email to us at: info@creativecakes.co.za. Book a company team-building workshop with us in Cape Town, JHB, Durban or PE! We LOVE hosting large (or small) group workshop activities as they are always so much fun and very well received. Book us early for your company's year-end function, or for a team-building workshop on the date and venue or your choice (subject to availability). We are flexible and able to assist with customising something to suit your company's needs. 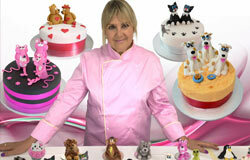 Carol is currently offering online video lesson in association with CakeSteps, for more information or to buy one of her video classes visit: www.cakesteps.com. Something to carry your cakes home in, such as a apple box. Once you have completed our Beginners 3D Cake Decorating Workshops you will be able to create your own 3D cakes very confidently at home by yourself! You will learn everything from baking the perfect cake, to the final professional decorating steps! For more information on our workshops, please download this pdf! "Die werkswinkel was ongelooflik lekker. 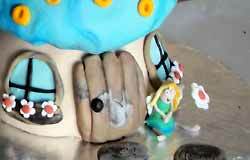 Dit was my eerste keer wat ek met plastiek icing werk, so dit was 'n nuwe uitdaging. Baie dankie weereens vir 'n baie lekker, leersame oggend." If you are unable to attend a workshop you can also learn how to create 3D cakes by following our step-by-step cake patterns in our Beginners 3D Cake Decorating E-Book. Click here to find out more about our E-Book. 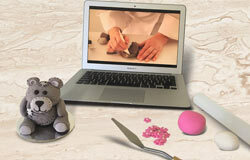 Creative Cakes also offers customised team-building workshops. To find out more please contact us. "I work as a doctor in a children's HIV unit. When my nurses cut the cakes, they gave some of the kids cake and some of the figurines that I made, the kids absolutely loved it!!!! The skills that I learnt at the course brought so much joy to my patients! If I had more time on my hands I would definitely attend the cupcake course and make the patients Xmas themed cup cakes for the festive season! "Thank you so much for yesterday class, i thoroughly enjoyed it. My nephews (aged 6 and 2 years) couldn't contain their excitement when they saw the cakes." "Please thank Carol for a wonderful and entertaining class on Sunday!! Looking forward to more... thanks"
"The workshop was an eye opener, a very creative one indeed, it made me feel like a little girl that I once was.The joy of looking at the final products of the cakes that I baked myself, wow its all unbelievable.Thanks to Creative Cakes for helping me express my creativity." 100's of ideas for other cakes & cupcakes to make in future." absolutely love to do another workshop/s:"
Venues include: Milnerton Library Hall, The Blow Fish, Dolphin Beach.